Steam rises from outdoor pools overlooking a waterfall at a 90-year-old hotel in Fukushima Prefecture’s Tsuchiyu Onsen. “What has saved us since the disaster are the loyal regular guests and the new visitors who have come to study our town’s renewable energy plant. Without them, I’m sure we would have had to close,” says Izumi Watanabe, who has been director of Sansuiso Tsuchiyu Spa for 37 years. 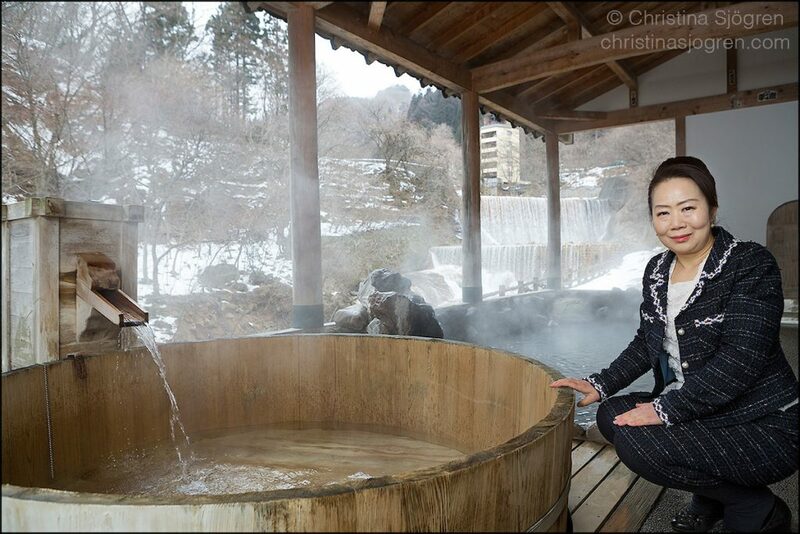 “People come from other onsen areas all over Japan to learn how they can become energy independent and how the binary plant we have doesn’t affect our hot springs,” she says, challenging the preconception that onsen communities, fearing a negative impact on their tourism business, typically hold back the development of geothermal energy in Japan. Watanabe was at a meeting in the city of Fukushima when the Great East Japan Earthquake struck seven years ago. She returned to Tsuchiyu Onsen to find her hotel intact, but two other hotels in the area damaged and the entire community without power. For three snowy days, Watanabe sheltered 70 of her own and other hotels’ guests without electricity, telephones or working internet. Gathered together, they ate whatever stored food they could find. Over the next six months, her spa served as accommodation for police and rescue workers, grieving families and people displaced by the tsunami and nuclear crisis. In total, this town of about 340 residents took in around 1,000 evacuees after the 2011 disasters. Five of the 16 hotels in Tsuchiyu Onsen have since gone out of business: two as a result of earthquake damage, the others on the back of a decline in visitor numbers from approximately 230,000 a year to about 70,000 as rumors of elevated radiation levels swirled. Izumi Watanabe, director of Sansuiso Tsuchiyu Spa. Members of the local community gathered together in October 2011 to discuss their future at what was dubbed the “Tsuchiyu Onsen reconstruction conference”. The locals decided they couldn’t simply go back to doing what they had done before — something new was needed to revive the town and create a safer future. Downtown, on the other side of the river that runs through this narrow mountain valley, Katsuichi Kato oversees Genki Up Tsuchiyu, the company the Tsuchiyu Onsen community established a year after the conference. Tsuchiyu Onsen wants to become a model ecological town for similar hot-spring areas by forming partnerships with industry, government and academia, thereby attracting not only tourists but also new residents in order to offset an aging and declining population. 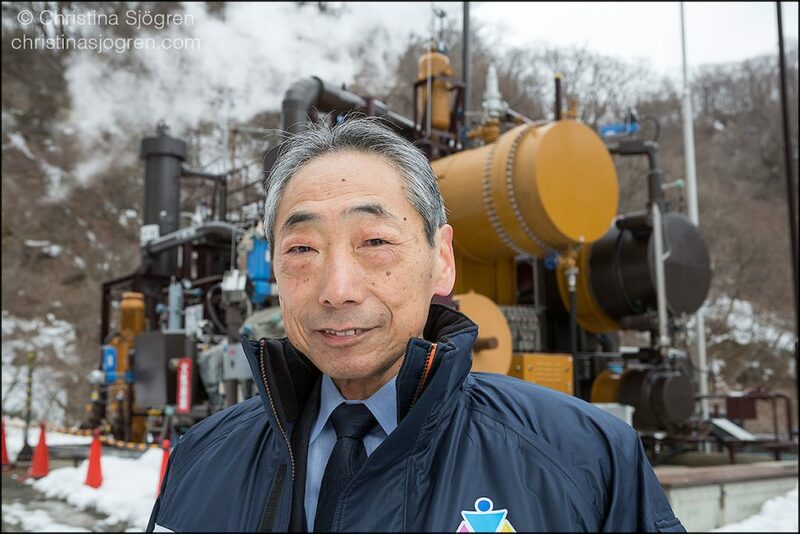 Katsuichi Kato, director of Genki Up Tsuchiyu, in front of the geothermal binary plant. The Tsuchiyu Onsen plant takes advantage of its hot-spring wells as well as its access to cold water, using the wells to heat a secondary liquid that turns the turbines when it vaporizes in its own closed system, and the mountain water to cool and condense the liquid at the end of the cycle. The onsen water that is somewhat cooled down in the process is used by the hotels. Genki Up Tsuchiyu is also using mountain water, which has been heated up a little as a result of cooling the secondary liquid, for shrimp farming, hoping to offer tourists the opportunity to eat — and even catch — local shrimp later this spring. Since geothermal binary plants were rare in Japan seven years ago, it was difficult for Genki Up Tsuchiyu to get a bank loan for the start-up investment of ¥700 million. With the help of Japan Oil, Gas and Metals National Corp., however, 90 percent was eventually funded through bank loans, after 10 percent had already been covered by a government fund. The plant has been up and running since November 2015. Kato estimates that the investment will have been paid off after 10 years, enabling Genki Up Tsuchiyu to subsequently make further investments with the eventual aim of becoming energy independent. The binary plant, which has a production capacity of 440 kilowatt hours, and the company’s small hydropower plant, with a production capacity of 140 kilowatt hours, together produce enough electricity to power 1,000 homes — more than the town’s overall consumption. has yet to invest in a battery that ensures the plant can continue to operate during a power cut, Tsuchiyu Onsen is still not self-reliant in terms of electricity. 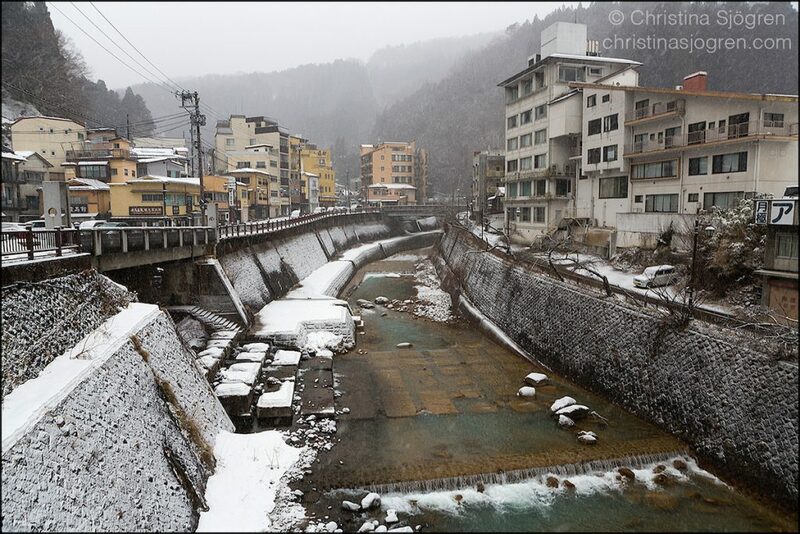 The town Tsuchiyu Onsen in Fukushima Prefecture. Until recently, Genki Up Tsuchiyu sold the electricity it produced to Tohoku Electric Power Co. These days, however, the company is selling its electricity to consumer cooperatives, and, like elsewhere in Japan, residents are free to choose which provider they purchase their electricity from. Kato is proud to show visitors both the binary plant and a tank that houses shrimp swimming in water that is 25 degrees Celsius, while deep snow covers the ground on the mountain outside. Last year, around 2,500 people visited Tsuchiyu Onsen to learn about developments in the town. Back at the office, Kato explains what the construction work farther up the street is about. An hour’s drive inland, past Mount Adatara and Mount Bandai in the city of Aizu-Wakamatsu, people also started organizing after the nuclear disaster. In July 2011, around 200 people met in the sake brewery owned by Yauemon Sato, a ninth-generation brewer, to discuss the disaster and the future. “It was at that symposium that I started to really think about the need for an energy shift away from nuclear power and about how rich the prefecture of Fukushima is in renewable resources,” Sato says. Sato had no background in electricity production, but he did have experience in trying to get small breweries into markets dominated by larger manufacturers. He took one of the leading roles in the growing community power movement. 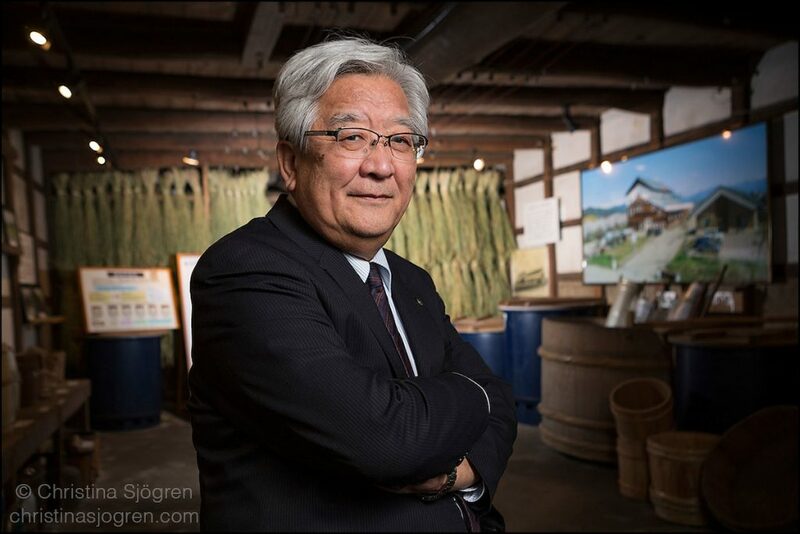 Yauemon Sato, ninth generation sake brewer and CEO of Aizu Electric Power Company. With the help of the Institute for Sustainable Energy Policies, which had also worked to promote locally owned renewable electricity production before the disaster, Aizu Electric Power Co. was established to manage the planned solar parks. Today, the company has 70 solar power sites and Sato has become a vocal critic of the large nuclear- and fossil-fuel companies that control the grid through regional monopolies, thereby hindering the new renewable energy companies from getting into the market. The monopolies argue that they are protecting the stability of the grid, so at present newcomers in some regions can only connect a maximum voltage of 50 kilowatts onto the network. 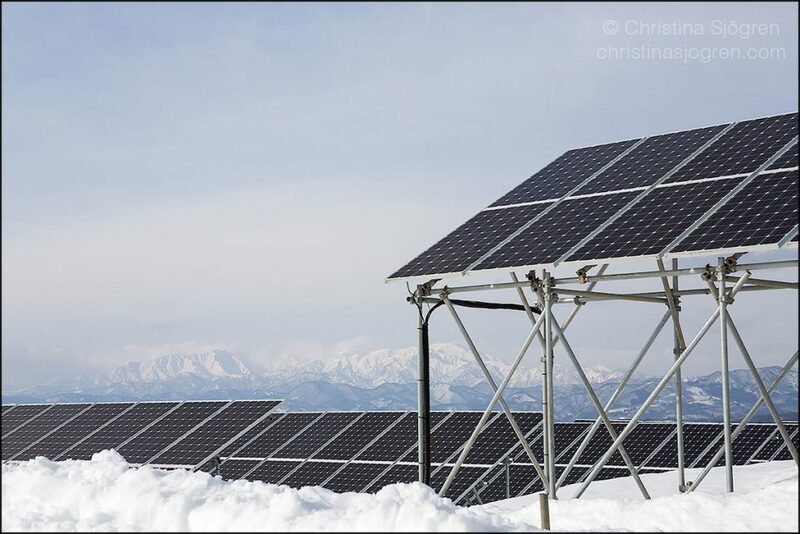 Aizu Electric Power Company’s solar panels are constructed so that they reach above the winter snow, and so that the snow easily slide off them. The Aizu region is where shogun Tokugawa Yoshinobu’s rebels fought one of the last big battles against government troops in 1868. The people’s rights movement flourished here after the civil war. It matters here that it is the people of Fukushima who have paid the ultimate price for the nuclear power that was sold mainly to Tokyo. Aizu Electrical Power Co., its logo a fist held up in the air over the letters AiPower, is challenging the electricity establishment of Japan, and is part of a bigger movement. The first World Community Power Conference was held in the city of Fukushima in November 2016 on the same day as the Paris climate accord came into force. One of the organizers was the Japan Community Power Association, in which Sato is a board member. He is also the vice president of Genjiren, an anti-nuclear power association that, with the help of the former prime ministers Junichiro Koizumi and Morihiro Hosokawa, pitched a bill to the opposition parties in January calling for an immediate halt to nuclear power, together with a more ambitious national goal for renewables. The grass-roots movement pushing for renewables is not alone. Both at home and abroad, the Japanese government has been criticized for failing to embrace broader renewable energy policies in the wake of the 2011 disasters while remaining open to the construction of additional coal plants and nuclear reactor restarts. Kåberger is also a former director of the Swedish Energy Agency, a member of the Swedish Climate Policy Council and a professor of industrial energy policy. He was recruited to the Renewable Energy Institute to bring an international perspective to the energy policy debate prompted by the nuclear disaster. Kåberger dismisses the claims of some private grid owners that they can’t connect new producers with a capacity of more than 50 kilowatts to their networks for stability reasons. Such arguments were also used by monopolies in Europe when electricity markets were liberalized 25 years ago. In Europe, Kaberger says, the reliability of the grid actually improved and renewables increased. Kåberger believes the government is willing to restart more reactors because it fears the financial consequences of failing to do so. The reactors are valuable for the balance sheets of the power companies, but in reality they represent a significant decommissioning liability. And yet, even government ministers have started to acknowledge that the current energy policy is unsustainable and that Japan is falling out of step with the rest of the world. Environmental Minister Masaharu Nakagawa, for example, has warned that the big power companies’ plans for 40 more coal plants in the next decade would become an obstacle for Japan’s pledge to cut emissions by 26 percent under the Paris accord. Foreign Minister Taro Kono has been even more direct in his criticism, lamenting Japan’s low goal of 22-24 percent electricity production from renewables by 2030, which is roughly where the global average sits already. Local advocates of renewable energy claim that the domestic media rarely cover the developments and debates that challenge the governments’ and the monopolies’ views. Kåberger agrees. What has surprised him most is that large electricity-consuming companies in Japan have defended these energy companies in public, even though they charge some of the highest electricity prices in Asia. He says domestic power utilities have got caught up in their own political rhetoric, stating that it is not possible to build up a renewable power fleet in Japan in the same way as is being done in Europe. Published in The Japan Times, March 11, 2018. More photos from Fukushima can be found on Christina Sjögren’s website.